Internet is a vast place. A place where you can find anything at any time. No matter how old you are and what your needs are, the internet will surely cater to you. There was a time when you would have to spend a whole day for buying a new pair of shoes. You had to visit multiple shops to get that perfect pair of shoes. However, now, you just need to make an account on any of e-commerce website, choose the product and it’s done. The product will be delivered at your door step within a day and you can even change/return the product. There is no doubt that Internet is now one of the most basic things which we need to survive. The way we use the internet however, vastly differs and is mostly based on who you are and what where your interests reside, meaning “It’s personal”. According to a recent survey, over 75% of Internet users surf the internet via their smartphones/tablets and only 15-20% people actually uses the desktop to use the internet for shopping and entertainment. So, the question being what are the features that makes mobile more personalized then desktop while fulfilling our personal needs! In short your smart phones that are so very personal to you will rule in the future. Such as: Not everyone owns a desktop or laptop you can get a smartphone with decent performance under INR 5000 but you still need INR 20,000 to get a decent laptop or desktop. Similarly, can we say there are many reasons for you to choose your mobile over your desktops. Not everyone can afford a desktop/laptop (+ decent internet connection) but getting a smartphone is not so challenging any more. So, it’s simple. There are more mobile users than desktop users browsing the internet via their smartphones. Every important website has got an app now. Let it be a social networking website or e-commerce website, every website has its own mobile app which works for all the platforms like Android, iOS and Windows. Just like how the way we access the internet has evolved, the way we browse is also evolving. Websites are embracing this trend by moving to the app world to facilitate smart phone users. If I can accomplish a task using the app on the phone, it makes more sense for me to engage in the app and finish it on the go, rather than dedicate time on the laptop. This I’m sure applies to the larger audience. Moreover, most of these apps now come pre-installed with the device so a user has got all the reasons to use the app. Smartphone makes the work easy and fast. Just imagine a scenario where you have to order a book from an e-commerce store. Now, you will either use your laptop or your smartphone for this purpose. For using the laptop, you will have to move from your place, start the laptop, connect it to the Internet, sign in with your account and after that you will place the order. However, you can just stay at your place, unlock your smartphone, open the app and place the order. The desktop version will take 10-15 minutes while the smartphone version will take only 2-5 minutes. Smartphone is more secure and safe. There are chances that you will have to share the laptop with your siblings or with your friends. Although, you can delete your internet history but, it’s not possible to do so every time when someone asks for your laptop. Suppose you are planning to buy a gift for your friend via online store and somehow the same friend ends up checking your browser history and your whole plan is ruined. On other side, you will never ever have to share your smartphone with anyone. You can do anything on your smartphone and no one will ever get a hint about it. Smartphone is more portable though, you can carry a laptop easily but a smartphone is much easier to carry. Now, suppose if you just received a notification that a flash sale is going on for a product on a specific website and you are in a metro train. Now, opening a laptop and buying from a sale in front of so many people can be awkward. However, if you are using a phone. The scene is completely different. Few days back we came to know that Myntra is going to shut down its website and focus only on their mobile app. 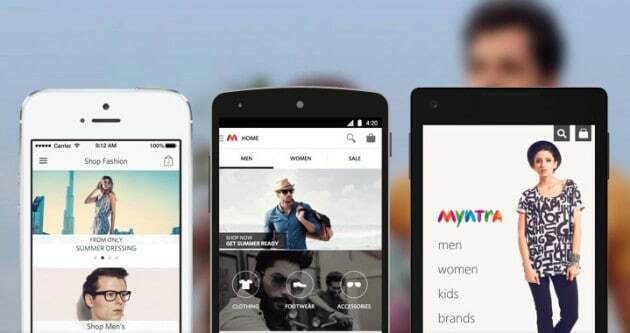 According to the sources, Myntra gets most of its traffic from mobile. It is an interesting strategy and is one of its own kind. Love it or hate it, purchasing something via mobile is pretty easy than doing the same on Desktops these days. I’m pretty sure most of us are using our mobile phones more than desktop computers these days, so, lets wait and see what awaits for us in the future. 2 Comments on Mobile vs Desktop: Which Will Rule The Future?